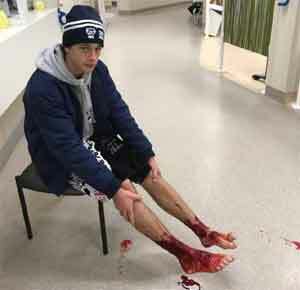 MELBOURNE, Australia A teenager who went for a swim at a Melbourne beach and emerged with his feet covered in blood has stumped marine experts. Sam Kanizay’s legs felt sore after playing a game of football on Saturday, so he decided to soak them at the beach. About 30 minutes later, the 16-year-old walked out of the water with his feet and ankles covered in what looked like hundreds of little pin holes that were bleeding profusely. Upon returning home, his parents promptly took him to the hospital. Kanizay’s father, Jarrod, said hospital staff had no idea what kind of creature could have caused the injuries. So Jarrod went back to the beach the following night with a pool net full of meat and captured the animals he believes could have been responsible. He took a video of dozens of the tiny bug-like creatures chomping on the chunks of meat. “I’ve never seen anything like this,” he told Channel Seven’s Sunrise program.